JEGS Engine Stand Bolt Kits include the bolts needed to attach your engine to most engine stands. Choose from 3/8 in.-16 or 10 mm-1.5 bolts to fit most engines. 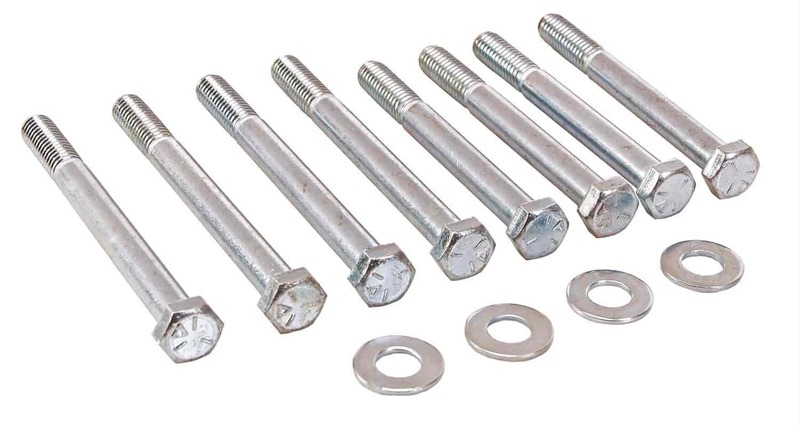 80043 - JEGS Engine Stand Bolt Kit is rated 4.0 out of 5 by 10. Rated 5 out of 5 by Evil Camino from Great Product ! I bought this kit for my small block 350 project. Definitely up to the task! Fast shipping! Rated 5 out of 5 by Frasur3 from Just what I needed Needed some bolts for my 350 block to go on the stand. These are just what I needed. Make sure you run a tap through your threads to make installation easier. Rated 5 out of 5 by BigB from Great! Very Strong! Bought these bolts and had zero problems. Very strong. Rated 2 out of 5 by Robo from What do i do with these? The bolt set is fine....however I have no use for them because the engine stand was backordered for two weeks and then I canceled! Rated 1 out of 5 by Roscoe from Bolt kit didn't fit my block, they were too skinny! Would these fit a Dodge Ram 6.7 liter diesel? No, this is made to fit most standard gas engines. Does this kit fit 02 Camaro 3.8? Yes, this kit should fit your engine. No, VW uses a metric thread pitch bolt.